Equitrend® Study #GoodToKnow Consumers also tap the network as ‘Most Trusted Real Estate Brand’ in study, which included input from more than 77,000 U.S. consumers IRVINE, CA (May 24, 2018) – Berkshire Hathaway HomeServices, part of the HSF Affiliates LLC family of real estate brokerage franchise networks, today announced it was recognized as “Real Estate Agency Brand of the Year” and “Most Trusted Real Estate Brand” in the 30th annual Harris Poll EquiTrend® study. More than 77,000 U.S. consumers rated 3,000 brands in about 300 categories in the online study earlier this year. Berkshire Hathaway HomeServices received the highest ranking in the Real Estate Agency category based on consumers’ perception of its brand familiarity, quality and purchasing consideration, among other qualifying factors. Berkshire Hathaway HomeServices has momentum in eyes of consumers. The brand was recognized for “Highest Overall Satisfaction for Repeat Home Sellers Among National Full Service Real Estate Firms” in J.D. Power’s 2017 Home Buyer/Seller Satisfaction Study. 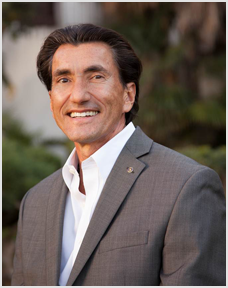 “Our network professionals are passionate about client satisfaction and service,” said Blefari. “We are elated their hard work and dedication to their profession has been recognized by consumers.” –more. The 2018 Harris Poll EquiTrend® study measures and compares the brand health of companies. Respondents offer their perceptions of brands, gauging their emotional connection to them plus brand awareness, influence and familiarity. 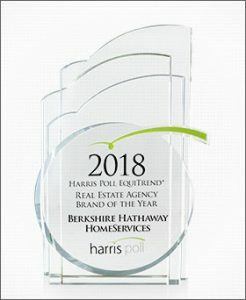 The Harris Poll is one of the longest-running surveys in the U.S. tracking public opinion, motivations and social sentiment since 1963 that is now part of Harris Insights & Analytics, a global consulting and market research firm that delivers social intelligence for transformational times. We work with clients in three primary areas; building a twenty-first-century corporate reputation, crafting brand strategy and performance tracking, and earning organic media through public relations research. Our mission is to provide insights and advisory to help leaders make the best decisions possible. Berkshire Hathaway HomeServices, based in Irvine, CA, is a real estate brokerage network built for a new era in residential real estate. The network, among the few organizations entrusted to use the world-renowned Berkshire Hathaway name, brings to the real estate market a definitive mark of trust, integrity, stability and longevity. The brand was just recognized as Real Estate Agency Brand of Year and Most Trusted Real Estate Brand in the 2018 Harris Poll EquiTrend Study, and for “Highest Overall Satisfaction for Repeat Home Sellers Among National Full Service Real Estate Firms” in J.D. Power’s 2017 Home Buyer/Seller Satisfaction Study.